An interesting Forbes.com article published back in 2014 discussed the results of the Ascend2 survey on digital marketing effectiveness. 54% of the survey respondents rated email marketing as the most effective digital marketing tool available. Websites, blogs, and social media rounded the top four tools at 48%, 47%, and 43% respectively. In a time where social media, websites, blogs, and SEO are getting the most digital marketing buzz, these results may seem unexpected and a little unbelievable. With the advent of newer forms of digital marketing, many have prophesied the eventual decline in effectiveness of email marketing, one of the oldest surviving tools. However, with 100 billion business emails still being sent each day according to radicati.com, the forewarning looks to be misguided. The marketing on social media, blogs, and websites can be likened to a very noisy marketplace. Customers are being bombarded with calls to action from every corner and everything is very loud. The entire experience can be disorienting and exhausting. With email marketing, the marketplace becomes quieter as it is personally curated by the customer. Emails that are blindly selling or communicating products that have no value can be immediately placed on the spam list or deleted. The messages that are opened, though, get the customer’s undivided attention – a priceless feat that is also the likeliest to get customer action. Email marketing is essentially a form of direct customer marketing. Direct marketing aims to build a close relationship with a client. And this entails getting to know the customer, crafting the right message that’s tailored to his needs, and speaking to him in an appealing manner. Since email marketing is “faceless”, the communication needs to take extra precautions to appear professional, courteous, and emphatic. All these make email marketing challenging to execute. But as the Ascend2 survey has demonstrated, it can also be the most effective tactic for getting customer engagement and conversion when done right. Getting on the whitelist means getting into the customer’s inbox and out of the spam folder. To do this, a customer must add the company’s email to their safe contact list. Emails received as spam is tantamount to them being deleted. So to ensure that your email campaign has a chance to be seen, it needs to get into the customer’s inbox. There are a variety of customer touch-points that can be used to subtly ask the customer to add your email address to their safe list. Some options include the welcome email, thank you page, and email pre-header. Reminders may also be incorporated in a paragraph in regular email broadcasts. And finally, a separate email specifically asking to be added to their safe list may also be done. An email marketing campaign always starts with a list of potential customers. Traditionally, customer lists were generated from the sales team or booth expos. Today, however, one of the best ways to do so is to maximise your website subscription. Making the subscription process a no-brainer is the easiest way to get more sign-ups. Another option is to entice customers by offering subscription incentives which can include free materials such as business templates and industry reports, to name a few. Since a customer’s email is a private place, you must get permission to communicate with him through this channel. Simply sending content without permission can be perceived as rude. And that can lead to the email being ignored or blocked altogether. Opting into a subscription list is one of the best examples of digital permission. On your subscription’s call to action, try to be as clear as possible about the content you intend to send and when you’ll be sending it. For example, it can say that the website intends to send updates and sales promos every month. The type of content is described and the frequency is defined. The idea is to manage the client’s expectations so they know what to expect. Once the expectations are set, make sure to follow through exactly as said as well. If a business emails more times than expected, customers may find it annoying. If a business emails less times than expected, the customer might forget that he subscribed in the first place. There are a number of tools available online to manage content deployment schedules, and a clear marketing plan can help ensure that the content supports a business goal, making it less susceptible to major changes as the campaign progresses. Transactional emails are mostly confirmatory emails sent as a response to a client action. These include welcome emails after a subscription, order confirmations, and feedback receipts. These emails can be used to engage specific calls to action and encourage repeat transactions. The premise being, clients who have already engaged with a business once are more likely to be easily encouraged to do so again. It can be tempting to fit a lot of communication into an email to make the most of a customer’s click or open. The danger with doing this is the desired call to action can easily get lost in the busyness of the words and format. Easy-to-digest content is ideal since it can clearly lead the customer to the desired action. Whether the call to action is information, a survey, or a purchase, simplicity is always better than complexity. Make it easy for the customer to willingly do what you want him to do. Today, emails are being accessed just as much on a smartphone as it is on a PC. With figures ranging from 51-65% in the US, for example, it is important to be mindful that the email campaign should be easy to read and visually balanced if viewed on a smartphone. Try Call Dynamics for 30 days! 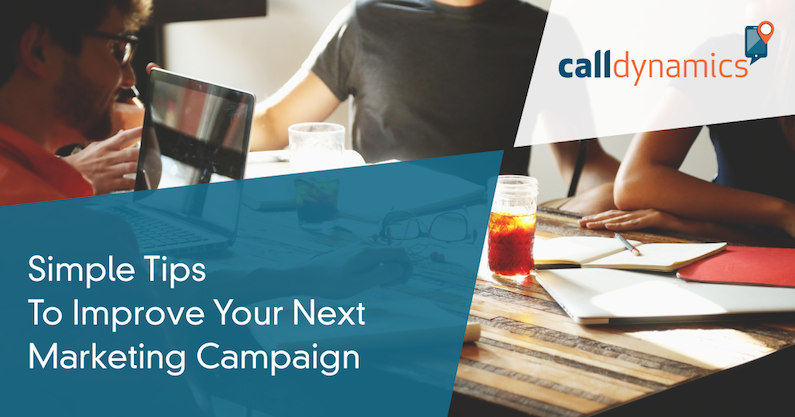 Ready to track phone calls that result from your email marketing campaigns? Use our 30 day Free Trial see what it could do for your business.